Superbook shared the adventures of characters Chris and Joy and their robot, Gizmo. A mysterious device—Superbook—transported them into history where they met heroes of the Bible and learned valuable lessons. Originally, the series was part of a successful outreach to Japan. “Over 8 million people a night watched Superbook on Japanese prime-time television, and the Bible became the nation’s best-selling book,” said Edie Wasserberg, CBN’s vice president of development integration. The series also aired on the Soviet National Channel in the Soviet Union. “CBN received over 6 million letters from children, introducing an entire generation to the Bible,” Wasserberg said. 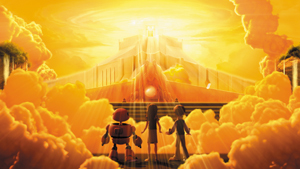 Eventually, Superbook aired in the U.S. and around the world with more than 500 million people watching. Fifty-two episodes were translated in 43 languages and broadcast in 106 countries. Today, children expect more from the media they watch, as animation has achieved a higher level of quality. “As enduring as the original 1981 series was, we needed to reimagine the look of the animation,” Wasserberg said. In 2010, CBN assembled a team of writers, designers, storyboard artists, composers and sound designers to update Superbook for today’s generation. This talent came from a wide variety of animation leaders: Disney, Blue Sky Studios, DreamWorks, Fox, Lucasfilm, Pixar, Sony Animation, Universal and Warner Bros. Studios. Their credits include The Lion King, Beauty and the Beast and Mulan. The reimagined Superbook episodes use the newest 3-D CGI (computer-generated imagery) technology. They also include English and Spanish audio tracks along with English and Spanish closed captioning. The episodes have appeared on ABC Family, CBS, NBC and Fox. “Together, we’ve been able to create high-quality visuals, fun characters and engaging stories that children and families love to watch,” Wasserberg said. Despite its success, the new Superbook was not being sold at retail. Aware of this lack, Charisma Media contacted CBN in 2014 and proposed a distribution partnership to bring the new Superbook to retail. “Our companies have a lot in common—complementary strengths and a mutual trust in each other’s influence and expertise,” said Marcos Perez, senior vice president, sales and marketing for the Charisma House Book Group. Tessie DeVore, executive vice president and publisher for Charisma House, appreciates the values that led to the partnership with CBN. With a market filled with digital tablets, smartphones and streaming services such as Netflix or Hulu, it’s easy to question the future of children’s DVDs. Dr. Mary Manz Simon, a parenting and childhood expert, keeps up on developments in the children’s market. Some retailers have noticed the change. But it’s not just streaming that has affected sales. “Technology and the interactive video games that kids play on their devices have affected the DVD industry for children,” said Barbi Shupe, owner of Heaven and Earth in Hampton, Virginia. That doesn’t mean children’s DVDs are on their way out. Cephas observed that streaming services don’t always offer updated shows. “That’s where buying DVDs comes into play,” the CLC retailer said. Recently, retailers have also noticed a slowdown of new Christian DVDs for kids. Superbook DVDs seem to have come at the right time. First, they provide retailers with a dependable stream of new releases. Season 1 features 13 DVDs that will be released on a staggered schedule. In October, two DVDs were released to the trade, The First Christmas and In the Beginning. Charisma Media plans to release an average of two DVDs a month until March 2016. At that time, The Miracles of Jesus, The Last Supper and He Is Risen will release in time for Easter. Secondly, the series appeals to older kids than VeggieTales does. With the target audience at 6-11 years old, “families who bought VeggieTales over the last three or four years are prime consumers for Superbook today,” Perez said. Finally, Superbook has a discipleship aspect that no other animated series offers for this age group. Biblical characters quote Scripture in the series. Each episode comes with a bonus—a discipleship booklet that includes a family discussion guide. “This is a great tool that families can use to enhance the discipleship aspect of each episode, and to further engage their children in applying the principles of God to their lives,” Perez said. Charisma Media has a significant marketing plan for the new Superbook. Simon suggested that stores also host a family movie night, showing an episode on a big screen in the parking lot or on a jumbo screen in the store. “Float the idea with homeschool groups that might already meet at the store to get their response,” she advised. Perez also suggested that retailers highlight the discussion guide and make local churches aware of Superbook as a resource they can use in children’s ministry. Video loops—Play the loops in your store to introduce customers to the DVDs. Collateral materials—This includes posters and other materials. Contact Charisma Media and choose the materials that work best for your store. Email templates—Use these to send e-blasts about Superbook to your mailing list, keeping customers informed of each new release. Endcap kits—Available in January, the kits will allow you to display five nonseasonal episodes. As more episodes become available, retailers can change the episodes they feature on the endcap. The suggested retail price of $15.99 makes these quality DVDs affordable for families. Many Christian retail customers are parents and grandparents. Either they grew up watching classic Superbook episodes in the 1980s or their children, who now have children of their own, did. Retailers will benefit as they tap into that nostalgia. Placing Superbook releases in your children’s DVD section gives customers a good reason to come to your store. Emphasize to customers that the new series isn’t available through streaming. Deborah Christensen is a freelance writer and editor with nearly 30 years’ experience.